It takes two vans to keep one running, or so the saying goes. We are now on our second van, but this one hasn’t run since we bought it in March. It’s not that Jason hasn’t been working on it – it has been a near daily activity. 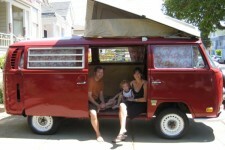 This 1971 red VW camper was literally a piece of crap when we bought it. It was impounded by Oakland police and sold at auction. We bought it from a guy who had supposedly cleaned it out. The inside had to be stripped clean, power-washed and scrubbed. And this van was in a little bit better shape than the first van. 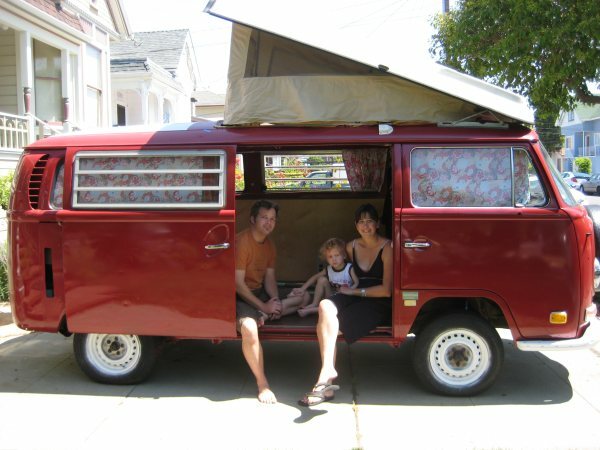 Would you drive around the world in this? Now, she has a shiny new coat of paint, wood floors, and cute curtains (fabric choice mine, tailoring by Jason). Bode named it Red Beard, the pirate. I decided that the van’s name was still TBD. We leave in 6 weeks and the van still does not run. It doesn’t even have the new engine we were planning on buying. We still have a 3 bedroom (+full basement) house full of stuff to sell and purge. We need a forwarding address for our mail. Ugh! I’m going to lunch with my friend Bree. After that, maybe I’ll get to work. Maybe. This is about the last time we saw you guys, you were talking all crazy about renting your house and taking to the road. Congrats on it actually coming about, the map you have built is impressive. Our dogs have since passed, but we still walk past your place with the new one almost daily. We got an RV too, but I don’t believe I could convince Tina to go some of the places you have gone. Not even sour we could get our Dodge Sprinter RV conversion into some of the tight spots you have taken the VW. I cannot imagine how cold and hot that van has gotten during the trip. Have the best trip ever!